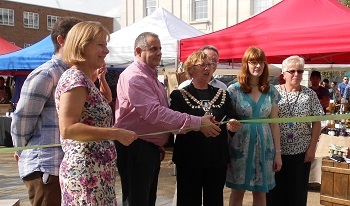 A completely refurbished Brentford Market Place was opened on Sunday 28 September amidst a carnival atmosphere created with dance performances, a steel band and other entertainment. Opened by Hounslow’s Mayor, Cllr Corinna Smart, and the Leader of the Council, Cllr Steve Curran, the refurbishment was part of £2 million-worth of improvements to Brentford’s town centre. The opening event celebrated both the completion of the renovations and formed part of the Mayor of London’s Summer of High Streets festivities. It was also one of what will be a string of such events organised by the council’s new town centre managers. Their roles are part of Hounslow’s investment to promote the borough’s town centres as places where business can flourish. The refurbishment was funded by £1 million each from Hounslow Council and the Mayor of London’s Outer London Fund and the new space was created by a team of landscape architects that included the renowned company Lynn Kinnear. Since the work began in April 2014, the market place has been transformed with new trees, high-spec wooden chairs and seating areas, an artistically designed fountain and new paving made from recycled York stone. The space is now more open and inviting, and much more suitable for the artisans selling high quality, affordable foods, as well as outdoor events. Cllr Curran, thanked those involved in the project and the Brentford High Street Steering Group for organising the Sunday market. He said: “This is the latest milestone in the on-going success story that is Brentford. With a new marina planned, the Bee’s building their new stadium, and the prospect of bringing the royal barge, the Gloriana, back home, TW8 is really buzzing with opportunities. “It’s all part of our vision to bring prosperity, jobs and great play and leisure possibilities to the borough,” he added. Mayor of London Boris Johnson, said people can now come to the market place to trade, relax, eat and play, bringing the area to life for the whole community. “This is exactly the sort of rejuvenation we want to see in our high streets,” he added. The entertainment at the opening event was provided by EB Entertainments, St Michael’s and All Angels Steel Band, Alluminae Dance, the Stage West Music Theatre Group and Hums Vision and the Waveline Band.